Imagine how you'll feel, listening to the soothing sound of the rain as it cascades down and fills the buckets of your rain chain. 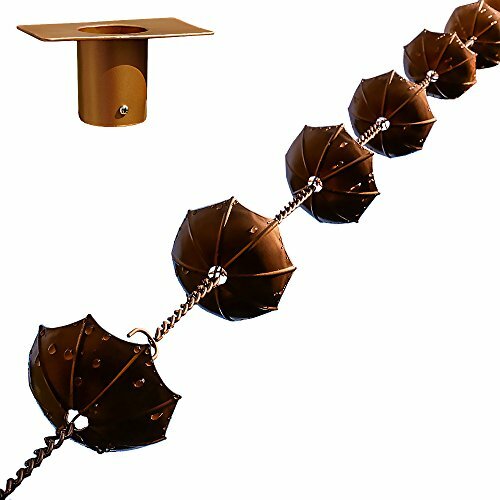 And with double the length of other rain chains and a free installer piece, it'll be easy to install your rain chain and make your home or garden a little more beautiful. You'll love your new rain chain, and your friends and neighbors will too! Click the button at the top of this page and get your rain chain today, because it's always a good time to add style and harmony to your home! ADD STYLE AND HARMONY TO YOUR HOME. Make your home the envy of the neighborhood with this beautiful alternative to standard downspouts. A perfect addition to your garden décor. THE SOOTHING SOUND OF RAIN. Creates a peaceful calming sound as the rain fills up the buckets and flows down the chain. DOUBLE THE LENGTH. Your rain gutter chain is 68" long, more than double the length of other rain chains! FREE INSTALLER PIECE. We make installing your rain chain downspouts a breeze with a FREE adapter piece. If you have any questions about this product by Sunflower Home and Garden, contact us by completing and submitting the form below. If you are looking for a specif part number, please include it with your message. Ancient Graffiti Flamed Birdhouse with Bird and Bell Rain Chain, 4.5" x 104" x 4.5"